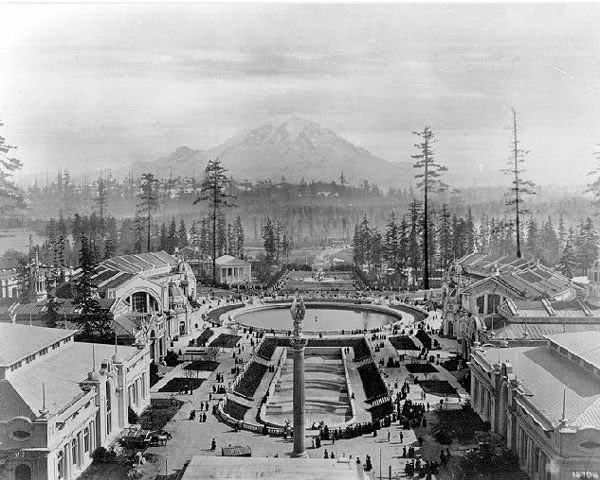 During this week in 1909 about 117,000 people attended the Alaska-Yukon-Pacific Exposition in Seattle, on the site of the University of Washington. During its six month run over 3 million people entered the gates of the fair. Previous to the exposition the University possessed only three buildings, but the fair's planners, with the work of renowned landscape architect John Olmstead, completely transformed the area with numerous buildings and manicured landscapes. The result was a "civilization in the wilderness," what as promised as the "World's Most Beautiful Fair." 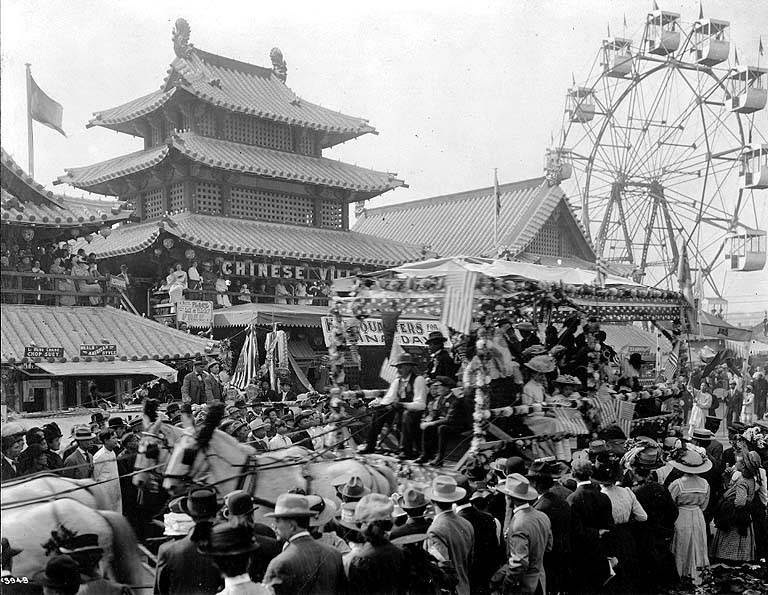 The fair was an advertisement for the Seattle and pacific area regional boosterism. 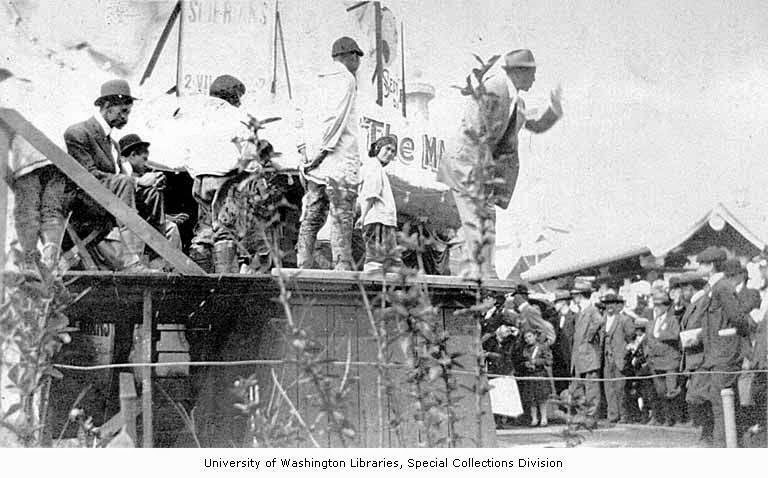 Seattle businessmen, the local state government, and average citizens pitched in to get the event off the ground. The planners used the promotion of gold as a way to bring people in from far away. That is, the Yukon gold rush ignited the an interest in a new "frontier" of riches, after the end of the California gold rush had previously brought an end to frontier-thinking in popular American culture. The waters of the pacific were advertised as the best for motor boating. The technology of the rail road would serve as a way for people to understand how civilization was being carved from the wilderness of North America. In the end, all this energy was put into it because if people attracted to the area then perhaps these attendees would relocate there, using rail service to transport themselves and their goods. These relocated people would purchase property and take part in the civic life of the region. 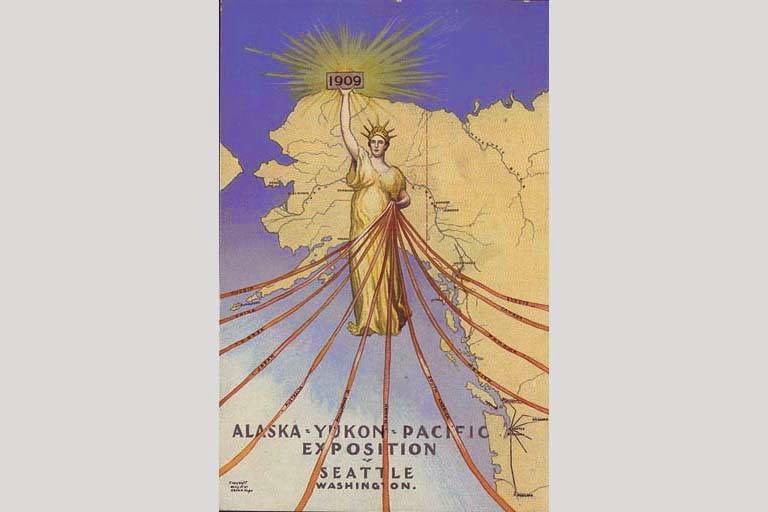 Alaska natural resources, such as gold and lumber, were the focus of the fair with Seattle being sold as a "gateway" to such a frontier. The attendees came expecting to see displays of non-white peoples from throughout the world as well as technological advances. Above you can see the Chinese village that was constructed to house and display Chinese cultural attributes that may have exotic to people in the United States at the time. The fairs planners were engaged in this re-imagining of the Asia-Pacific rim by allowing participants to come to understand how Seattle was geographically poised to successfully trade with Asian nations in ways that many hadn't considered before. The opening ceremonies included representatives of the Japanese Navy. 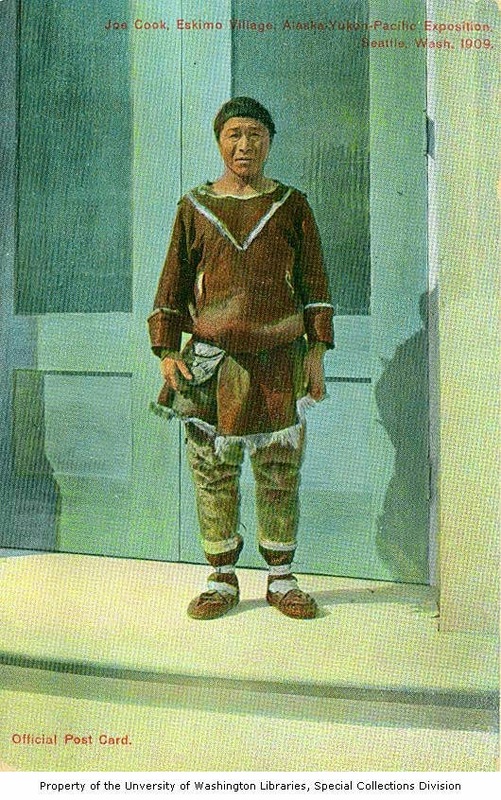 Announcer at entrance to Eskimo Village, Alaska-Yukon-Pacific-Exposition, Seattle, Washington, 1909. Note on the photograph:Eskimo Village. In the Eskimo Village there are Eskimos from Siberia, Alaska and Labrador, and visitors have an opportunity to study the various tribes. The Eskimo Village is one of the largest attractions on the Pay Streak. The representations of Native peoples at these fairs ran hand-in-hand with the display of technological advancement and the celebration of nationalism. There is a grand amount of scholarship examining the way indigenous cultures have been presented at world's fairs. The presentation of Native people as foreign and primitive have always played an important role in these fairs. 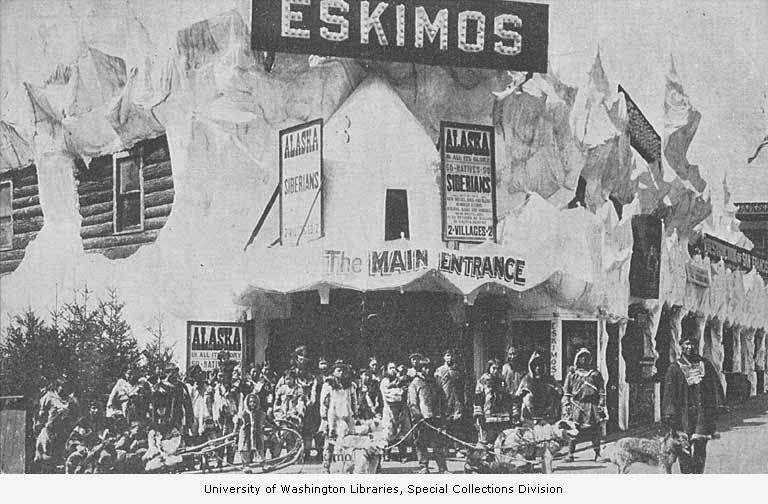 As you can see below, there was an "Alaska" "Eskimo" village where the architecture was formed to resemble a glacier. Those who attended the fair could purchase postcards of Native peoples, like the one of Joe Cook, above. Or have their pictures taken with them, as in the photograph below. Son of William H. Seward, chief figure in the purchase of Alaska. 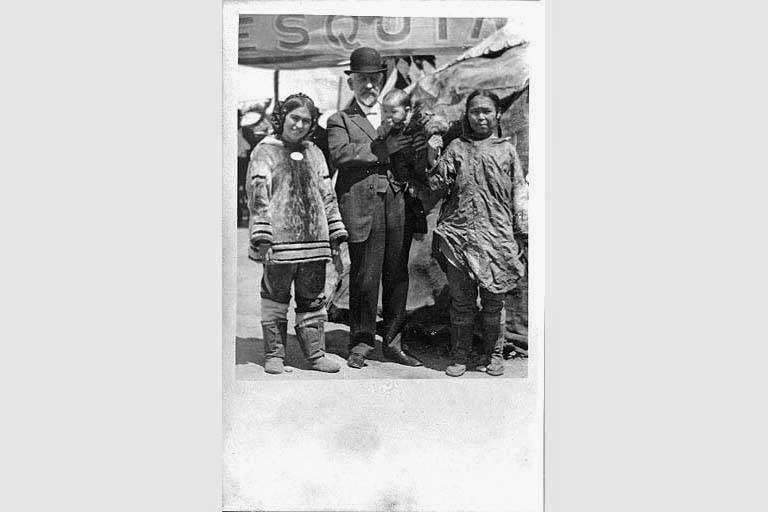 Eskimos left to right: "Columbia", Eskimo from Labrador; infant named "Seattle"; and mother of the child. 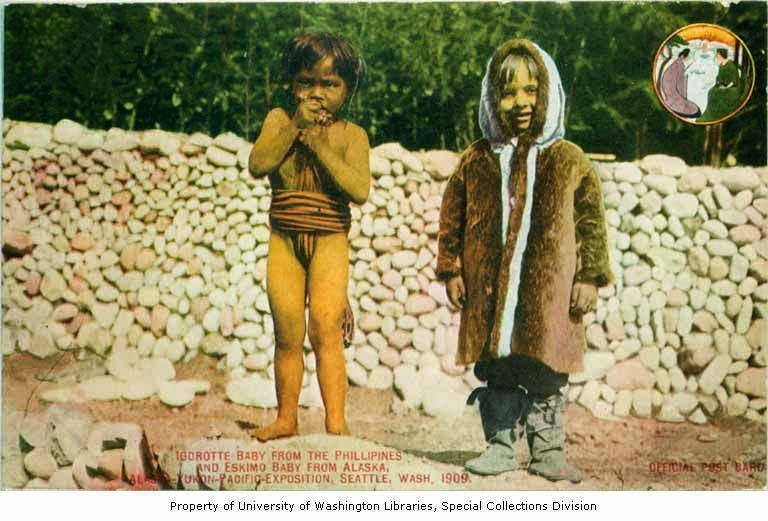 Below is a photograph of Native children from Alaska and the Philippines, the "Eskimo" and the "Igorotte." While very "modern" Alaska Natives and people from the Philippines were working away throughout the fishing industrial complex in canneries and boats from Seattle to Kodiak, at the exposition they were both presented as primitive spectacles, so distant from the articulations of civilization. In May 30-November 29 2009, the Burke Museum, on the campus of the University of Washington, Seattle, held an indigenous artistic exhibit responding to the way Native folks and culture were exploited during the exposition. 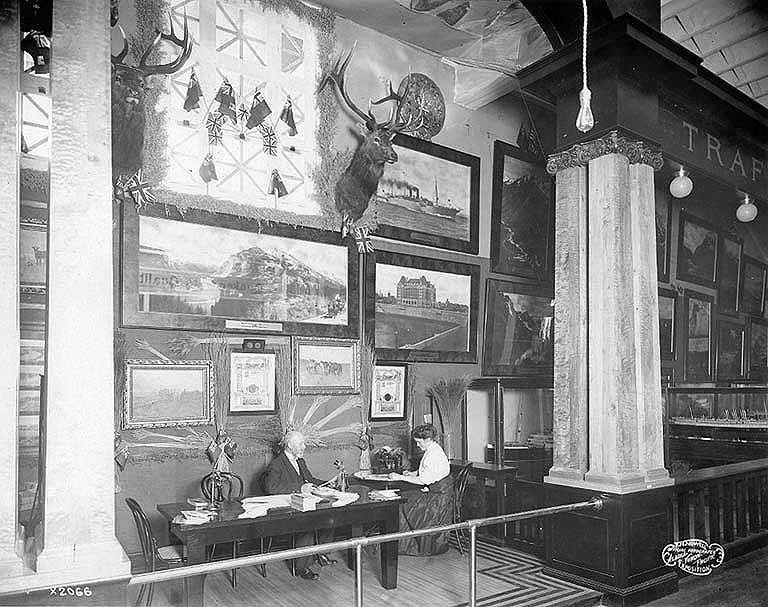 The museum's project "Juxtapos[ed] historic objects and photographs from the 1909 fair with contemporary artwork by Native artists to explore how the representation and understanding of indigenous people and cultures has changed or not changed over 100 years." This short film below interviews the artists involved with the 2009 response. Just over halfway through appears Swil Kanim, and I think he presents a very provocative indigenous perspective.